The SideOut Club Service Award for 2009 recognized the many years of volunteer work by Jim and Eilleen Ellis, who were not present for the ceremony. MSU Qualifies for NCAA Tournament! Despite a tenth-place finish in the Big Ten, MSU's overall season record of 17-15 was good enough to earn a spot in the 2009 NCAA Tournament. The Spartans will go to Lexington, Kentucky to play the Kentucky Wildcats on Friday, December 4. A victory in that game would lead to a second-round game against either Oregon or Clemson. Come out to join fellow MSU fans for the 10th Annual Spartan Volleyball Tailgate Party on Saturday, November 14, 2009 before the match against Purdue. We will start around 3:30 at the usual location in front of the main entrance to Jenison and continue until game time at 6:30. Bring a dish or grillable item to share. Also needed are grills, charcoal and folding tables. If you can bring a grill, charcoal or folding table, or if you have any questions, please contact Cathy Caswell at 332-4353 or at caswell@msu.edu. Help Spartan Volleyball "Bust Breslin" ! The volleyball program is hoping for a big crowd in the Breslin Center on Wednesday, October 21 for the televised game against the Michigan Wolverines. 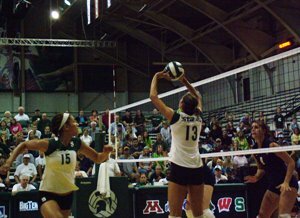 Last year's "Bust Breslin" event saw attendance of over 5,300, which was a new record for MSU volleyball. MSU Federal Credit Union members get in free, as do high school volleyball teams. The first 1,000 people through the doors will get a free "Bust Breslin" T-shirt. For the first time since the Big Ten initiated a full conference schedule for volleyball in 1985, the MSU Spartans will begin the conference season with a spotless record. As of September 21, the team has the distinction of being one of only eight Division I teams without a loss. In addition, only one of the other seven teams—Penn State—can match MSU's 12-0 record. The Spartans' performance so far has bumped them up to the number 16 spot in the national rankings. MSU's last preconference tournament appearance will be at the 2009 Clemson Classic. They open the tournament against 6-1 Furman at 11 am Friday, and play the host Tigers (7-2) at 7 pm. Saturday at noon they conclude the tournament against Presbyterian (4-6). MSU continues preconference play at the University of Illinois-Chicago. Their first opponent is Duquesne, at 6:00 pm Friday, September 11. On Saturday, they meet Georgia State at 1:00 pm, followed by UIC at 8:00 pm. You can follow these games live through the links below. MSU will play at Cleveland State University this weekend, with the opening match against Syracuse on Friday, September 4 at 1:00 pm. They will play the host team twice, at 7:00 pm Friday and 4:00 pm Saturday. You can follow these games live through the links below. The prognostications of the Big Ten volleyball coaches were announced August 13, 2009, and MSU fans were pleased to see the unanimous selection of middle blocker Vanessa King to the all-conference preseason team. There were four other unanimous picks from three schools on the 14-member squad. Penn State led with four overall selections, two of them unanimous. The Big Ten released its television schedule on August 5, and it includes two Spartan home games and one road game. The 2009 volleyball schedule starts with an impressive lineup for the MSU Invitational Tournament August 28 and 29. MSU's first opponent, on Friday night will be Southern California, who finished 2008 ranked #13 in the nation. MSU has not hosted a Pac-10 team since 1996. The Sideout Club 2009 Annual Meeting will be held on April 27 at noon at the Hall of Fame Café on Lake Lansing Road in East Lansing. The annual meeting will be held to elect board members and review the Club financial report. Coach George will update us on the progress of the volleyball team so far this spring and give us an inside peek into the 2009 season and outlook. We hope to see you all on the 27th. Spartan volleyball will host Western Michigan for a competition/practice event on Saturday, April 11, 2009. This will take place in the women's basketball auxiliary gym on the east side of the Breslin Center. Fans can enter at the ticket office entrance, located on the south side of the arena; the auxiliary gym is located on the mezzanine level. Also participating will be alumni teams from both schools, who will play an exhibition against each other. The morning (9:00 to 11:30) will be devoted to training exercises, with the actual matches played in the afternoon (alumni at 1:30, MSU vs. WMU at 3:00). The gym will be open all day, with no admission charge, so fans can come to watch whatever portion interests them. For the two weekends preceding the home event, the Spartans will compete in tournaments in Illinois. On March 28, they will be at the Great Lakes Center in Aurora Illinois, and on April 4, they will be at the Three Wise Men Tournament at Loyola University in Chicago. The NCAA has approved women's sand volleyball as a varsity sport for Division I and II schools starting with the spring 2011 season. This follows experimental spring sand tournaments the last couple of years involving a dozen or so schools. Proponents see it as an additional opportunity for women athletes and a way to capitalize on the growing popularity of the pro sport. However, others have raised questions about the effect of this addition. For example, is sand volleyball too specialized to the point where it favors schools in warm climates? Will it only be added by schools with large athletic budgets? Will this become an additional responsibility for indoor coaches or will new coaches be hired? Will sand volleyball attract new athletes, will it become a second sport for indoor players, or will it draw players away from the indoor game?